This new eBook includes 480 pages and more than 1000 images dedicated to all the topics and tutorials exclusively for the V19 programs for Windows. - NEW: learn how to get the best results using the new Material Editor. - NEW: explore how to add automatic Shutters to your windows. - NEW: all the libraries’ formats and organization reviewed with descriptions and images, including how to create and use the new Plant Symbol Library. - NEW: create cross sections of your project using the new and powerful 3D Cutaway Tool. - NEW: get the best results of the new features such as Doors, Dormers Walls, and much more. With Learning Punch! 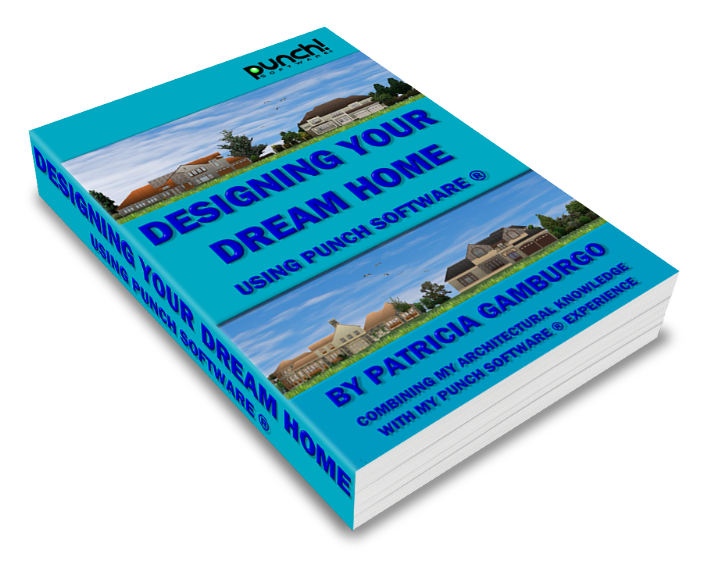 Software: Training, Tools & Tutorials by Patricia Gamburgo, you will easily master Punch! Software in a fun way! - NEW:A new feature in Pat’s eBooks: the Screen Guides. Browse through images of the most important screens of your program, then click on the desired feature and you will be directed to the exact topic in the eBook! - NEW: Get the best results of the new features such as Dormers, Lighting Assistant, and much more. - NEW: All the New libraries’ formats and organization reviewed with descriptions and images, including how to create and use the new 2D Plant Symbol Library.